The Content Manager was designed to create a more flexible, all-encompassing repository for all your content. In your Queue you'll find all of your content that has yet to be approved and published. Below is the default view of your Queue where upcoming stories' images, titles, publish and expiration dates, categories, and sources are detailed. Below a post's image, you have the ability to edit, view, approve, or delete a piece of content. To edit the story image, update summary text, add interest categories, change the article title or set any distribution settings before approval - Click the little pencil icon. This will bring you to Cerkl's Content Creator, where you can make any adjustments you need. If you're accustomed to viewing your queued posts from more of an editor's perspective, we've got you covered. In the very top right corner of your screen, you'll see the below options. Click on the 'Expand' icon to see your content in a new light. 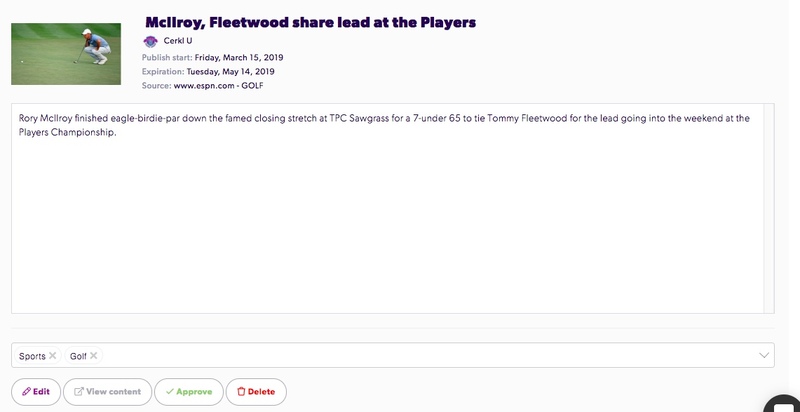 With the expanded view of your upcoming content, you get a sneak peek at the actual text of the article sans formatting. Here, you can also edit interest categories directly from the Queue rather than having to go into the post itself to edit them. Click on the dropdown arrow on the right side of the categories to see all of your options or click on the X next to a category to untag the story.